Making warnings more meaningful and useful for the public…Reducing ‘over-warning’ in which businesses provide unnecessary warnings…Giving businesses clearer guidelines on how and where to provide warnings. Candlemakers selling in California will need to implement a new label warning system by August 30, 2018 to maintain “safe harbor protection” under Proposition 65’s requirements. Violators can be subject to daily fines up to $2,500 for each area of violation. The new label warning system has several chief objectives, including: “Making warnings more meaningful and useful for the public…Reducing ‘over-warning’ in which businesses provide unnecessary warnings…Giving businesses clearer guidelines on how and where to provide warnings.” This new requirement is on top of a variety of label disclosures already addressing safe and healthy usage to protect people and property. As awareness of candle labeling heightens because of the California deadline, it’s a good time to refresh understanding of other candle label forms and functions. 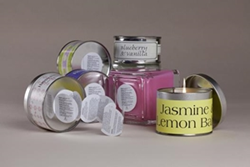 Candle labels can be compelling sales tools—engaging prospective buyers before anything else. Therefore, they deserve the attention needed to stand out from the crowd with impactful messaging and graphics. Grammatically correct content that paints a memorable picture as well as the pictures themselves are primary considerations. 1. Deploy candle labels for all seasons. For every holiday, season, activity, commemoration, and celebration, custom candle labels can speak volumes. And it doesn’t cost an arm and a leg to get creative year-round—for any occasion imaginable. From Farmers Markets to Winter Wonderland scenes, and Fall Festivities to Rites of Spring, dynamic custom labels can help tell—and sell—the story. 2. Make health and safety concerns paramount. Personal health and safety, as well as helping sustain the planet, all merit top attention by candle-makers. Common-sense, regulations, and going green all factor in to the importance of paying close attention to how the candle is made and how it is explained. Everything from concerns over how to safely burn and extinguish a candle to potential health concerns tied to candle ingredients (e.g., California’s Prop 65 warnings) can mandate explanatory labels. 3. Pay close attention to label function. Custom candle labels should be able to handle a variety of “heavy lifting” requirements. Paramount durability concerns for candle labels are flame resistance and heatproofing. Logistically, needed turnaround times, quantities needed, required barcodes/consecutive numbering or other tracking and inventory tools, how the labels will wind/unwind for product placement, regular ordering quantity patterns, and the like are all important issues to address before a deadline looms for product labels. 4. Know the regulations. Custom candle labels are an integral part of informing and educating consumers. Regulations are weighty; therefore, the responsibility to provide adequate explanations and warnings also is weighty. This includes, but certainly is not limited to, looming Prop 65 requirements in California. Heat, handling, combustibility and conscientious use all come under the broad heading of compliant candle labels. Both the National Candle Association (NCA) and ASTM standards organization weigh in, offering information both about the letter of the law as well as the spirit. According to NCA guidelines derived from the ASTM F2058 Standard detailing rules and regs about label disclosures and warnings, all members are required to perform fire safety testing and detail appropriate safety tips on their labels addressing such issues as burning within sight, keeping away from combustibles, and keeping away from children. Use of labels that provide key safety information helps ensure that candles continue to light up your life, not burn down your structure.